Chicago’s blighted Englewood neighborhood has seen few positive developments in the past several decades. The new campus of Kennedy – King College at 63rd and Halsted, built at a cost of over $200 million, was expected to spur development in the immediate area, but there’s currently little evidence of it. One goal of the new campus was to “bring safety and stability to the streets of Englewood.” There’s ample evidence that goal hasn’t been met. 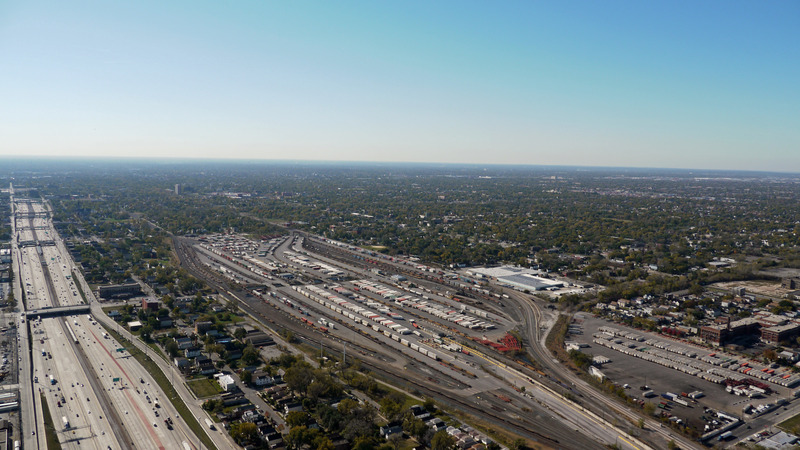 Norfolk Southern railroad has a major development underway in Englewood, an 84-acre expansion of its existing 140-acre intermodal freight yard, pictured above. The Chicago Tribune reported yesterday that the City Council’s Housing Committee moved the project forward by agreeing to sell the railroad 105 vacant city-owned lots in the expansion area. As you might expect, not everyone in the Englewood community views the freight yard as a positive development. When one looks at the thriving central part of the city and the new construction that is now beginning again, and then the utter desolation of the neighborhood in this video, one cannot help but be totally astaunded that these things can exist side by side in the same city. Tearing part of this desolate area down and converting it into a railroad yard offers the best hope of making this area a productive part of the city that makes a positive contribution to the tax base and creates jobs. Chicago has historicallly been a major railroad hub and reinforcing the city’s role as this is a positive development. Such a major railroad yard would seem to imply excellent access to railroad transportation. Should it therefore not be possible to attract industry that relies heavily on such rail trasportation to locate adjacent to the yard? I think most of those industries truck goods to rail hubs now. Unfortunately. OR they need huge tracts of land. However, this should be looked into.